The Marilyn Dennis Show featured Remnant Countertops today! We are so excited to share that Latitude’s remnant marble vanity countertop was featured on the Marilyn Dennis Show, on CTV today! The segment illustrated how you can bring stunning designs into your home on a small budget… Like 60% to 75% less on countertops from Latitude, dependent on the options you choose. Are you tired of looking at your kitchen countertops or bathroom vanity countertop but don’t feel you have the cash to pay for a contractor and new cabinetry? Designers have been using Latitude’s remnant program to get beautiful high end Granite, Marble and Quartz countertops for their clients while still keeping within conservative budgets. 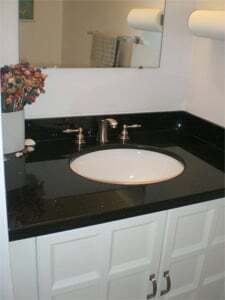 We simply use remnant pieces to manufacture your custom made countertops. Sometimes it is too good to be true. With our remnant program, it really is true. All you have to do is find the remnant piece that works for the shape and size of your project and add a fabrication or fabrication and installation quotation to get a full price. Not only is our price on the remnant program incredible, we also turn orders around in 8 business days! 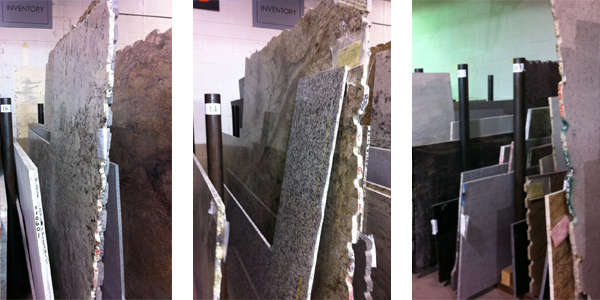 With over 32 years of experience, Latitude is known as the most trusted source for countertops in Ontario. You have probably already seen our manufacturing and installation expertise on other Television Design shows such as Love it or List it on W Network and on Candice Tells All on HGTV. 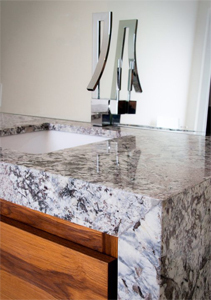 We also supply countertops and natural stone design projects to Sarah Richardson on Sarah’s House and Sarah 101. We can certainly do the same for you whether you choose a remnant granite or marble or if you want to select from one of the 9 major brands of countertop options we carry. UPDATE! MARCH 2017! We have just launched a new, easy to use, online catalogue and webstore for our massive inventory of remnant pieces including; Caesarstone Quartz, Silestone Quartz, Viatera Quartz, Hanstone Quartz, Natural Stones such as Granite, Quartzites and Marbles plus many more brand name engineered quartz. On the new Remnant Warehouse, you may see the selection and prices of the vast selection of remnant pieces we have in stock. We have a multitude of pieces with photos, however, not all photos are uploaded yet... so please feel free to visit us to see these pieces in person. Prices listed on the Remnant Warehouse are for the remnant pieces only. Remnant pieces are as is and first come, first serve. If the layout of your cabinetry does not need to change, you can easily give your kitchen or bathroom a brand new look with a stunning granite, marble or quartz countertop facelift. You don’t have change all the cabinets or demolish walls, simply freshen up your space by painting the cabinets and changing the countertop to granite or quartz. So if you’re ready to update your space, extremely discounted rates on “remnant material” is a good place to start. Here is an example of a stunning Bianco Carrara marble kitchen countertop, designed by Emmanuel Belliveau of Floro Designs and host of World’s Greenest homes. The material came from remnant inventory. Remnants are new and unused pieces of stone that are “leftover” from a previous—normally larger—project. Because of the high volume of larger kitchen countertop projects that Latitude manufactures, we have an incredibly large selection of sizes and colours in our remnant inventory for you to choose from. The remnant program allows you to get the superior quality and craftsmanship of Latitude at bargain basement prices. When you see prices at other places that are too good to be true for your countertop, beware. They may be using poor quality granite, prefabricated pieces or they may not have the expert equipment to fabricate or install the countertops correctly. Remember, you rarely escape the adage “You get what you pay for”. At Latitude, we make sure that you always get Latitude’s amazing level of service, expert workmanship and quality products. 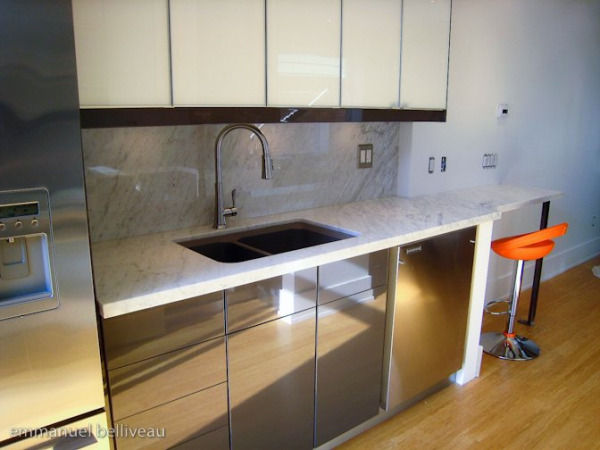 Our remnant program works best for vanities and smaller condominium kitchen layouts as well as galley kitchens and laundry room countertops. When looking for remnant granite and quartz for your kitchen countertops, we must find pieces that are from the same block and lot or we will have to cut all countertops from the same piece of stone. Anytime two pieces of countertop sections are seamed together, as in a corner or in a long section, they must come from the same block of stone so that when the pieces meet, the colours match as closely as possible. Generally, it is more difficult to use remnant pieces for large kitchens. If you’re unsure if you can get your kitchen or bathroom countertop out of a remnant piece or you would like get a quote for your space; contact us by filling in the Contact Form on the top left of this page. We will call or write to you within 1 business day. You can also visit our showroom, call us at 416-638-8586 or email info@latitudeonline.ca. We look forward to assisting you with all of your remodeling projects!